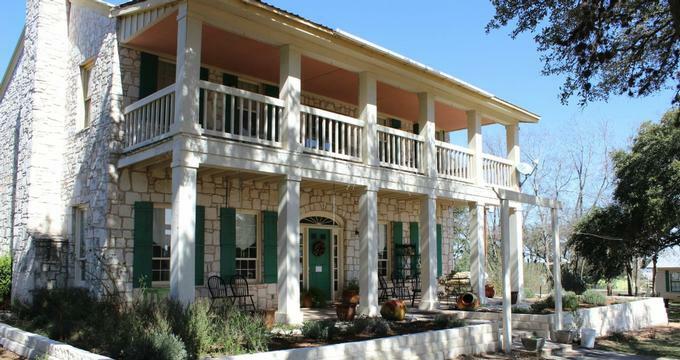 Located in the heart of Johnson City, Chantilly Lace Country Inn is a charming bed and breakfast-style inn that offers a romantic getaway in the Texas Hill Country. Situated within easy driving distance of Austin, Marble Falls, Fredericksburg, and Wimberley, the elegantly appointed guesthouse is surrounded by six acres of beautifully landscaped gardens with winding paths and pretty garden benches. Three large porches with rocking chairs and a porch swing and a lovely open-air pavilion are perfect for relaxation, while comfortable furnishings inside the Inn offer cozy respite in the colder months. Six gracious suites offer king-size beds in deluxe linens, private bathrooms with whirlpool tubs, and in-room conveniences such as microwaves, fridges, and coffee makers, and a delicious gourmet breakfast is served every morning in the dining room. The Inn has a gift shop which sells handmade candles, jewelry, and soaps, and a park with a swimming pool, tennis court, and a walking trail is located across the road from the Inn. Chantilly Lace Country Inn features six beautifully appointed guest suites with king-size pillow-top beds dressed in deluxe linens and hypoallergenic pillows, en-suite bathrooms with single vanities, shower-over-bath combinations, or soaking tubs and separate showers, fluffy towels and bathrobes, and organic bath products. Sitting areas have comfortable sofas and armchairs and open onto private porches and decks with bistro tables, chairs, and lovely garden views. In-room amenities include flat-screen televisions with satellite channels, coffee makers, fridges, microwaves, irons and ironing boards, hairdryers, and complimentary wireless Internet. Rosemary Cottage is a two-room cabin that features a king-size bed with a pillowtop mattress, deluxe linens and hypoallergenic pillows, and an en-suite bathroom with a bowl sink vanity and step-in shower, fluffy towels and bathrobes, and organic bath products. A second room offers a comfortable living room with an ornate cathedral ceiling, plush leather sofa, table and chairs, and in-room conveniences, and opens onto a large private deck with bistro table and chairs. The Rose Garden Suite features a king-size bed with a pillowtop mattress, deluxe linens and hypoallergenic pillows, and an en-suite bathroom with double vanities, a shower-over-bath combination, fluffy towels and bathrobes, and organic bath products. A separate den area has a leather futon sofa and access to the full upper front porch on the top level of the house. The Taste of the Country Suite features a king-size bed with a pillowtop mattress, deluxe linens and hypoallergenic pillows, and an en-suite bathroom with double vanity sinks, a luxurious whirlpool tub and separate walk-in shower, fluffy towels and bathrobes, and organic bath products. A cozy sitting area has a sofa and access to the large upper porch on the top level of the main house. The Carriage House Suite I offers a beautiful king-size bed with a pillowtop mattress, deluxe linens and hypoallergenic pillows, a romantic loveseat and bistro table and chairs. An en-suite bathroom has a luxurious whirlpool tub and wicker dressing table and chair, fluffy towels and bathrobes, and organic bath products, and in-room amenities include flat-screen televisions with satellite channels, coffee makers, fridges, microwaves, irons and ironing boards, hairdryers, and complimentary wireless Internet. The Carriage House Suite I features an exquisite queen-size cedar bed with a pillowtop mattress, deluxe linens and hypoallergenic pillows, a romantic loveseat and bistro table and chairs, and an en-suite bathroom with a shower, fluffy towels and bathrobes, and organic bath products. In-room amenities include an electric fireplace, flat-screen televisions with satellite channels, coffee makers, fridges, microwaves, irons and ironing boards, hairdryers, and complimentary wireless Internet. The Lavender Cabin is a cozy two-room cabin with a king-size bed with a pillowtop mattress, deluxe linens and hypoallergenic pillows, and an en-suite bathroom with single vanity, a shower-over-bath combination, fluffy towels and bathrobes, and organic bath products. A cozy sitting area has a sofa and flat-screen televisions with satellite channels, and in-room amenities include coffee makers, fridges, microwaves, irons and ironing boards, hairdryers, and complimentary wireless Internet. A delicious gourmet breakfast is served every morning and includes freshly brewed coffee, tea and other hot beverages, fruit juices, fresh fruit platters, yogurt, cereals, hot entrées and signature dishes, eggs, and freshly baked bread, muffins, scones and more. Chantilly Lace Country Inn offers an array of amenities and guest services, including a delicious gourmet breakfast served every morning, an on-site gift shop that sells a variety of handcrafted items and jewelry. The Inn is surrounded by six acres of beautifully landscaped gardens in which guests can relax, along with three large porches with rocking chairs and a porch swing and a lovely open-air pavilion.